Toxic Deductible Sludge | Tax Deduction! Toxic Deductible Sludge – Tax Deduction! Back in 2010, British Petroleum’s Deepwater Horizon drilling rig exploded and spilled millions of barrels of oil off the Louisiana coast. Countless small business owners, including fishermen, hotel operators, restaurants, rental companies, and seafood processors, suffered and went bankrupt. State and local governments lost billions more in tax revenue. Lawyers, who may be some of the few people to actually profit from the disaster, are still fighting over compensation and claims, and will probably still be fighting until long after anyone reading these words is still alive. BP has been gushing cash ever since the spill to clean up its mess and restore its reputation the damaged environment. The total includes $20 billion for a trust fund to settle financial claims, $4.5 billion in criminal fines and other penalties, and $18.7 billion to settle federal and state claims. But there’s good news for the company, too — they’ll be getting billions in help from their friends at the IRS! We may never know exactly how much BP writes off because tax deductions on settlements are confidential business information. But we know the company’s federal tax rate is 35%. 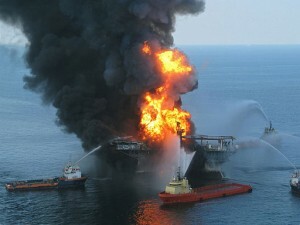 So that means, if BP writes off, say, $20 billion of the payments, they’ll save $7 billion in taxes. That money, of course, comes out of all of our pockets. So pat yourself on the back for playing your part in cleaning up the Gulf. Nobody ever plans to suffer through a disaster like the Deepwater Horizon spill. But it’s worth remembering that how you clean up your mistakes can make a real difference. So think of us as your financial “911,” and don’t hesitate to call if trouble strikes!